Good afternoon, folks. Skal Labissiere waited until the very last game of the regular season to finally show out. Let’s talk NBA. Welcome to the final regular season BBNBA recap post. The season is far from over with the playoffs tipping off on Saturday, but there was still plenty to talk about on the final day of the 2018-19 season. There were several notable names who were held out for rest/health reasons, such as Karl-Anthony Towns, DeMarcus Cousins, Eric Bledsoe, and Enes Kanter, but the reserves more than picked up the slack. Before we get into the monster performance Skal put up on Wednesday, let’s start from the top. Starting in Atlanta, where Isaac Humphries played in his fifth consecutive game to end the Hawks season. Unfortunately, he only saw a little over one minute of action but still managed two points and a rebound. Humphries ends his stint with the Hawks averaging 3.0 points and 2.2 rebounds in over 11 minutes per game. Bam Adebayo played only 18 minutes for the Miami Heat, who decided to roll with veteran Udonis Haslem to cap off their season. The former Kentucky big still managed 10 points and six rebounds. Dwyane Wade finished off his NBA career with a 25-point triple-double. The rookie season for Kevin Knox ended the same way it began – with a poor shooting game. Knox shot 3-12 from the field and 0-6 from deep for nine points to go along with seven rebounds. Knox needed the offseason to get here A.S.A.P. Jamal Murray and the Denver Nuggets can officially prepare for the franchise’s first playoff appearance since 2013 after finishing off the Minnesota Timberwolves at home. Murray posted 17 points, eight rebounds, and seven assists for Denver. The Los Angeles Clippers apparently didn’t want the regular season to end, as they needed overtime to knock off the Utah Jazz, 143-137. Shai Gilgeous-Alexander registered eight points, two rebounds, three assists, and two steals to complete an outstanding rookie season. And even though I don’t want to mention it, I will, because Grayson Allen scoring 40 points is… surprising. Not because it took him 30 shots to get there or because he shouldn’t even be on an NBA roster, but because he managed to go an entire basketball game without overextending his foot and chopping it into someone else’s ankles like an out-of-control Razor scooter. Now that is impressive. Shoutout to Grayson. But now for the game of the night. The Portland Trail Blazers emptied the bench against the Sacramento Kings and it was… awesome. De’Aaron Fox still put up 17 points and nine rebounds on 8-10 shooting in a mere 16 minutes because there literally wasn’t a single member of the Blazers on the court who could stop him. Seriously, this was a borderline G League game at times. Willie Cauley-Stein put up eight points and five rebounds in only 17 minutes. The real fun, however, was the 40 minutes of Skal Labissiere I’ve eagerly been waiting to see. Skal led the BBNBA with 29 points, which somehow wasn’t a career-high (he posted 32 against the Suns in March of 2017), and added 15 rebounds, which tied a career-high. This was the first time Labissiere has seen real minutes since, well… last season. He shot 12-17 from the field against the Kings, drilled two threes, had a couple of insane putback dunks, and looked like the best version of himself I’ve seen since he was a rookie. The Kings also blew a 30-point lead after sitting the starters. But I honestly can’t even properly describe Labissiere’s play because it was something I haven’t seen from him all year. He was posting up, driving to the basket, draining stepbacks. The confidence was oozing. Now, he was going up against defenders such as Nemanja Bjelica and Caleb Swanigan – who did not look flattering in the Kings uniform – and his rookie teammate Anfernee Simons put up 37 points, as well. I still don’t know how good Skal is yet and all this game did was build up some hype, but he played a great game. Maybe he can sneak in for some playoff minutes. None! The playoff bracket is officially set, too. I’ll have a detailed post outlining each matchup later in the day. Playoffs begin Saturday. Good morning, folks. Anthony Davis has seen his last game as a member of the New Orleans Pelicans. Let’s talk NBA. It was just your regular day in the NBA on Tuesday. Magic Johnson unexpectedly (and thankfully) quit on the Lakers without telling his boss first. Dwyane Wade and Dirk Nowitzki both scored 30 points in their last NBA home game. Jamal Crawford scored 51 at age 62. The Thunder and Blazers both won off clutch shots at the end of the game. The Pistons officially made the playoffs. And Anthony Davis is still trolling, but let’s start with recapping the games. Brandon Knight – my Comeback Player of the Year – scored nine points for the Cavaliers in their blowout loss to the Charlotte Hornets, who were eliminated from the playoffs. Malik Monk added eight points, three rebounds, and four assists for Charlotte, who were without Michael Kidd-Gilchrst for the second straight game as he tends to personal matters. Wade was the centerpiece of Miami’s 23-point win over the Philadelphia 76ers, but Bam Adebayo played a great game without having to worry about a patrolling Joel Embiid. Adebayo posted 19 points and nine boards on 8-11 shooting for the Heat. Kevin Knox registered a 17-point, 10-rebound double-double – the third of his career – in a Knicks win over the Chicago Bulls. In New Orleans, all three former Wildcats were sidelined, but that didn’t prevent Anthony Davis from digging deep into his bag of petty streetwear. Davis wore a shirt that had the words “That’s all folks!” printed across his chest and it’s kind of hilarious but also not a great look. Interpret that as you please. DeMarcus Cousins added 21 points, 12 rebounds, and six assists for the Warriors against his former team as Golden State beat the Pellies 112-103. In Utah, the Jazz edged out a win over the Denver Nuggets despite Jamal Murray going for 22 points and five rebounds. And lastly, in Los Angeles, the Portland Trail Blazers beat the Lakers thanks to a game-winning shot from Moe Harkless. Enes Kanter led the BBNBA with 22 points and 16 rebounds on 8-13 shooting for Portland. Tonight is also the last night of the NBA regular season. Playoffs start on Sunday. Well, here we are – days away from the start of the 2019 NBA Playoffs. This was my first full season covering the BBNBA for KSR and while it’s not quite over with yet, it has granted me more amusement, entertainment, and headache than I ever imagined possible just from watching/writing about that beautiful orange ball. Now is when the fun truly begins. The upcoming playoffs aren’t going to resemble the postseasons of old. The ones where the good matchups don’t formulate until the Conference Finals or even the NBA Finals. No, these playoffs are going to be fantastic from start to finish. There’s going to be something of notice and value in each and every matchup and I intend on taking you all along for the ride with me. The unfortunate news is that most of the BBNBA roster is spread out across non-playoff teams. So, in reality, there will only be about 7-8 former Wildcats who will receive significant minutes in the playoffs – and possibly a few more depending on what happens with Bam Adebayo in Miami and Malik Monk/Michael Kidd-Gilchrist in Charlotte. Regardless, the content will be there. But before we can preview any potential playoff matchups (mainly because the standings are still not set in stone just quite) we need to hand out some awards. I split the categories into Most Valuable Player, Most Improved Player, Rookie of the Year, Comeback Player of the Year, along with a 1st and 2nd team All-BBNBA. Let’s get to it, starting with MVP. Through all the nonsense and media interrogation Karl-Anthony Towns has been dragged into as a result of the whole Jimmy Butler-Minnesota debacle, he deserves this award. Towns is having his best season to date, even if the raw numbers don’t indicate it. He’s averaging a smooth 24.2 points, 12.4 rebounds, and 3.4 assists per game while shooting nearly 52 percent from the field and right at 40 percent from three. If we take away the first few weeks when Butler was a member of the Timberwolves, those numbers go up even slightly higher. Minnesota won’t make the playoffs this year after finally returning from a long hiatus the season before, but what KAT has been able to do for his team since the All-Star break is borderline historic. He has been just ripping teams apart for 30-point, 15-rebound performances, drilling an unorthodox amount of triples while dominating in the post and demanding his teammates move the hell out of his path of terror. Towns has a legitimate shot to land himself on an All-NBA team this season, as well. He was the Wolves best player all season and one the franchise has seemingly (and finally) gone all in on. It’s about damn time, too. 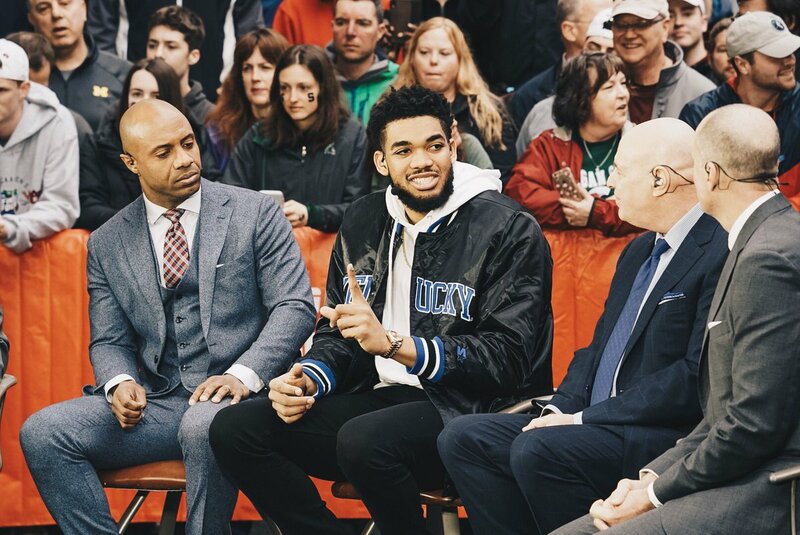 There’s a chance KAT is looking at real NBA MVP awards in his near future. This was actually a hard one to pick. Out of De’Aaron Fox, Eric Bledsoe, and Julius Randle, all three players made massive strides in their game this season. Bledsoe’s was probably the most impressive, considering his age and where he was with Phoenix last year. Fox was expected to get better after a worrisome rookie year, but not this good. However, Randle went from a Los Angeles Lakers afterthought to a player that would have the second-best on that roster – next to LeBron James – had they resigned him. What Randle has done in New Orleans amidst all the internal drama with the Anthony Davis trade saga is nothing short of impressive. Davis has been in and out of the Pelicans lineup for basically the entire second half of the season (which is why you won’t find his name on any of these personal awards) with Randle carrying the frontcourt responsibilities. And he did so in spectacular fashion for a team actively trying to lose. The former Kentucky big is averaging a career-high 21.4 points, 8.7 rebounds, and 3.1 assists per game this season while shooting over 52 percent from the field and – most impressively – over 34 percent from deep on 2.4 attempts per game. Randle is no longer just a bruiser in the post, he’s elevated his game to stretch across all areas of the court. He’s a much smarter passer, can be the focal point of an offense, has extended his range, and can still body the living hell out of any and all opposing big men. What was once purely brute strength has now been harnessed into pinpoint timing and accuracy combined with that overbearing size of his. He’s one of the biggest bargains in the NBA at under $9 million this season and he should expect double that if he decides to test free agency in the summer. Shai Gilgeous-Alexander should easily make 1st Team All-Rookie this season, joining future stars such as Trae Young, Luka Doncic, Deandre Ayton, and Marvin Bagley. So it wasn’t hard to pick him as the BBNBA Rookie of the Year. Kevin Knox had a historically poor shooting season for a rookie and Hamidou Diallo couldn’t get off the bench enough outside of the Dunk Contest to fight for the award. But SGA isn’t winning this award by default, he truly is one of the best rookies in what is shaping up to be an insanely talented draft class. There’s a reason the Clippers – a 47-win playoff team – have started him for 72 out of 81 possible games so far. He’s the type of player they can build around. The type of player they can trust to learn from his mistakes. His progression from November to now would be unheard of if it didn’t mirror what he did during his lone season at Kentucky. Gilgeous-Alexander has averaged 10.9 points, 2.8 rebounds, and 3.3 assists for the Clips while shooting over 47 percent from the field and 36.7 percent from deep. He’s methodical in how he attacks the basket, almost like an ever-suspicious kitten plodding around its new house, slowing gaining a complete understanding of its surroundings. He stops. He goes. He waits… He plots. There aren’t many 20-year olds that NBA historians can point to and confidently say that they understood the game better than SGA does. He’s the starting point guard on a playoff team as a rookie and that is wholly by design. He’s the most valuable asset the Clippers have right now. An ankle injury turned into heel surgery. He missed over a month next year with an adductor strain. That same adductor would later end his season and five days later he underwent surgery for a sports hernia. He missed the entirety of the 2017-18 season with a torn ACL. He played organized basketball for the Houston Rockets in mid-December of 2018 for the first time since February of 2017 – nearly two years away from an NBA court. But the injuries didn’t fully subside. He was limited during his time in Houston with constant knee soreness. Then he was traded to a tanking team in Cleveland during the first year of the post-LeBron era. And that is where Knight has earned this recognition. As a member of the Cavaliers, Knight has started 25 out of 26 games, averaging 8.5 points and 2.3 assists per game. He’s become a mentor to Cavs rookie point guard Collin Sexton, working alongside the energetic guard from Alabama who has recently been playing his best basketball of the season. Knight has been through more pain in the previous two years that most NBA players experience in their entire careers. Now, he’s making the most of what Cleveland is giving him and relishing every second of it. And finally, here are my selections for the two All-BBNBA teams. Yes, Davis still made the list. Even if he appeared in fewer than 60 games this season, he was still soooo good when he was in. Shoutout to Darius Miller and Willie Cauley-Stein, too, for some solid, under-the-radar seasons. Davis has missed the last six games with back spasms, and I’m guessing he won’t play tonight vs. Golden State. What kind of reception will he get from the New Orleans crowd? With Kentucky’s season officially over, it’s now that nerve-racking time of the year where Wildcat fans obsess over which players will be staying and which ones will be spending their immediate future in the big leagues. Nothing has been made official yet, but the consensus seems to be that P.J. Washington and Keldon Johnson are likely heading to the NBA Draft. Both are considered first-round locks and should benefit from what is being publicized as a historically weak draft. Reid Travis will obviously audition for a spot in the draft while the decisions for Tyler Herro and Ashton Hagans are still up in the air. Below I am going to compile the numbers and predictions from five different sources that have evaluated these players and ranked them according to their research. The mock draft rankings will be pulled from ESPN, NBC Sports, Sporting News, Tankathon, and The Athletic. Let’s start with the two players expected to be drafted the earliest; Washington and Johnson. Conclusion: Washington is going to be a borderline lottery selection. Him going anywhere in the top 10 would be a shock at this point, unless he does incredibly well with individual team workouts. The top of this draft is littered with wings/guards and Washington might actually be one of the two or three best frontcourt prospects along with Jaxson Hayes (Texas) and Brandon Clarke (Gonzaga), but his 6-foot-7 frame is going to hurt his draft status more than anything. However, shooting over 42 percent from three as a sophomore gives him a massive boost in his potential as an undersized forward. The NBA is thriving off of players like that right now. Tankathon slotting Washington at 24th is low. Any team would scoop him up before he hit the mid-20s, in my opinion, but somewhere in the 11-19 range sounds about right for what he brings to the table. I doubt there’s a multiple time All-Star lurking inside of Washington, but a rotational NBA role player could very well be in his future. Conclusion: The consensus on Johnson is a bit more clear than Washington. All five sites have the 6-foot-5 wing going in the 15-21 range. He’s much more raw in terms of overall talent than Washington, but is clearly a bonafide scorer from most areas of the court and was a massively underrated rebounder during his freshman year. Johnson’s NBA ceiling is far superior to Washington in that the NBA is built around big wing players like Johnson who can create their own offense. He should be more of a “work-in-progress” type of prospect, but one that some team in the late-teens will take a chance on if they missed out on a wing player earlier in the draft. Conclusion: Personally, I hope Hagans comes back for another season, but I would easily understand why he’d choose to try his hand in the NBA after just one year. Hagans has the benefit of being younger than most of his peers, which could result in him having a “longer leash” of sorts once he does make it to the next level. The back end of this draft is nothing special. Hagans could very easily sneak into the second round and if an NBA team gives him a guarantee, I think he should take it. Hagans could just as easily come back and boost his stock to the moon with an improved season as the lead guard on another elite Kentucky team, but his overall play dwindled towards the end of this season and could happen again. In my opinion, Hagans is the riskiest prospect from an NBA perspective. There’s a lot to love about his defense but way more to question about his offense. If next year’s draft is better than this one – as it is expected to be – Hagans could improve and still find himself in the second round. A lot of it is going to come down to what he hears from the NBA Combine in mid-May. Conclusion: If you’re hoping and praying that Tyler Herro returns to Kentucky for his sophomore season, you might want to avert your eyes from any and all NBA mock drafts. The Bucket is going to get a first-round guarantee by some team. His defense improved enough throughout the season that it can no longer be held against him and his offense has been a proven trait of his since December. Anywhere outside of the lottery and into the late first-round appears to be the consensus from the media. There’s guaranteed money as a first-round pick and Herro could face a similar decision that Hagans is feeling: would he find himself in the position again next season? If Herro comes back, Kentucky can kick off the season as a title favorite. But will there be more draft-eligible players in next year’s draft that could surpass him even if he shines again as a sophomore? These are surely things he’ll want to try and get a better idea of come the Combine. If I’m Herro (and I very clearly am not), I put my name in the draft and don’t look back. Only ESPN and The Athletic had mock drafts that also included the second-round. Neither of them had Reid Travis listed. I’m not entirely sure where Travis sits right now with NBA front offices and scouts, but we’ll definitely have a better idea of that after the Combine. With Travis, there is no returning to UK. Preparing for the NBA draft is all he has left as a college athlete. Travis has a solid wingspan, a massive frame, and great instincts around the basket. Extending his range to the perimeter towards the end of the season surely did him some favors with scouts, but at 23-years old, his potential isn’t going to be as promising as the 19 and 20-year olds. He’s a below average passer and not quite the shot blocker NBA teams would like. He’ll find his way onto a team somehow, whether it’s through the draft or being picked up as a free agent, but it could come with a lengthy stint in the G League first. The 2018-19 NBA regular season is drawing to a close. Most teams only have roughly 2-3 games left on their schedules and the playoff bracket is beginning to take shape. Outside of a close four-team race for the last three spots in the Eastern Conference, the postseason is all but ready to go. With that being said, there are going to be plenty of former Kentucky players featured in this year’s postseason and probably even more that will be receiving an early vacation. Injuries have already ended the season of a few BBNBA players including John Wall and Isaiah Briscoe, but there are still some players limping to the finish line right now. Let’s catch up on those players real quick and see where everyone stands with the playoffs less than a week away. Devin Booker has been ruled out for the remainder of the season as of April 5th after he landed sideways on his left ankle in a game against the Utah Jazz on Wednesday. Booker has already missed time this season due to various hamstring injuries and with only three games left on the Phoenix Suns schedule, it’s probably best they hold him out in order to prepare for a healthy offseason. In case you didn’t know, the Suns are only 19-61 on the season and have been effectively tanking for the better part of the regular season. DeMarcus Cousins has only missed five of his 33 games in a Golden State Warriors uniform – mostly due to rest or “load management” – and he’s expected to be healthy for the top-seeded team in the West’s playoff run. Anthony Davis’ New Orleans Pelicans have been trying to awkwardly navigate their way through the rest of this dysfunctional season and it apparently still includes plans of playing the former Kentucky big man. Davis has sat out the last five games for the Pellies but is listed as “probable” for Sunday night’s game against the Sacramento Kings. I’d guess he sits, considering the Pelicans aren’t trying to win games right now, and he’ll hopefully be healthy for the offseason. Michael Kidd-Gilchrist has sat out several games over the last month, but not because of health reasons. However, he will not play for the Charlotte Hornets on Sunday as he tends to a family matter. Willie Cauley-Stein of the Sacramento Kings is also out tending to a family issue but is not injured. The Kings are already mathematically eliminated from the playoffs and the Hornets’ hopes are getting slimmer and slimmer with every passing day. Along with Davis, Darius Miller looks to be done for the season. After sitting out his last three games with a hip injury, Miller has already been ruled out for Sunday’s game and odds are he sits out the Pelicans last two games. Alex Poythress will miss his 15th straight game with an ankle sprain. The Atlanta Hawks only have two more games left and Poythress has continually been ruled out since early March. His season is likely done, as well. The good news is that the majority of BBNBA players who will compete in the postseason are healthy. Eric Bledsoe (MIL), Jamal Murray (DEN), Shai Gilgeous-Alexander (LAC), Enes Kanter (POR), and Cousins (GSW) will headline the 2019 NBA postseason for Kentucky and should all be ready to go, barring anything unforeseen happening in the next few days. And if the Miami Heat can sneak into the playoffs, we can add a healthy (and starting) Bam Adebayo to that list. The NBA playoffs start April 13. Good afternoon, folks. We’re recapping games from Friday night and Saturday in today’s post. Let’s talk NBA. Let’s quickly cover the game lone former Wildcat who was on an NBA court Saturday. Eric Bledsoe put up a killer 33-point, 11-assist performance in a Milwaukee Bucks win over the Brooklyn Nets, just a day after being ejected not even three minutes into his game against the Philadelphia 76ers on Thursday. The win puts the Bucks only one-win from cracking the 60-win threshold and the loss puts Brooklyn in a two-way tie with the Magic for the sixth seed in the Eastern Conference, just a half-game ahead of the Detroit Pistons. The rest of this post will be covering the games from Friday night, as there were a lot of them. And, unfortunately, a lot of absent Wildcats due to various reasons. But let’s start in Charlotte, where the Hornets earned a must-win victory over the Toronto Raptors to keep their playoff hopes alive. Jeremy Lamb hit a game-winning three with under four seconds left to keep the Hornets in the hunt and only two games out of the playoff picture. Michael Kidd-Gilchrist added 10 points, two rebounds, and three assists for Charlotte while Malik Monk contributed 10 points of his own to go along with four rebounds. Kevin Knox posted 13 points and five rebounds on 5-14 shooting for the New York Knicks, who were whipped in Houston by the Rockets, 120-96. In a pivotal game for Miami in Minnesota, the Heat fell 109-111 to the Timberwolves despite the anti-triple-double stat line of 13 points, 12 rebounds, and 11 turnovers from Karl-Anthony Towns. Bam Adebayo registered eight points, four rebounds, and four steals for Miami, who currently sit a whole game behind Detroit for the final playoff spot out East. The Sacramento Kings were without Willie Cauley-Stein in its loss against the Utah Jazz as the former Kentucky big man sat out with what was listed as “personal reasons” and it is believed to be a serious family issue, according to NBC Sports. His status for Sunday’s game against the Pelicans is unknown. The Kings were also without De’Aaron Fox for the majority of the game after he was sidelined with an ankle injury sustained in the first half. Fox played only seven minutes and scored four points. The injury isn’t believed to be serious and he’s listed as probable for Sunday night, but with the Kings’ playoff hopes already dead, there might be not much of a reason for him to play the last few games on a bum ankle. In Phoenix, the Devin Booker-less Suns knocked off the New Orleans PeliCats in extra time, 133-126, who were without both Anthony Davis (back) and Darius Miller (hip) for the third straight game. Miller will likely miss the rest of the season while Davis could play on Sunday. Booker has also been shut down for the remainder of the regular season. But Julius Randle did play and dammit he played great. Randle posted a BBNBA high for Friday with 31 points on 13-24 shooting while also pulling in 14 boards. The Denver Nuggets were led by 23 points from Jamal Murray on its way to a 119-110 victory over the Portland Trail Blazers. Murray shot 7-15 from the field and also added four rebounds and six assists in the process. Enes Kanter shot an efficient 12-17 from the field for 24 points and seven rebounds for the Blazers. DeMarcus Cousins sat out the Warriors NBA Finals rematch against the Cleveland Cavaliers due to rest ahead of the playoffs while Brandon Knight contributed six points, three rebounds, and three assists (on 3-10 shooting, however) for the Cavs. And finally, in Los Angeles, we had a crosstown battle between the Clippers and Lakers with the gold-and-purple getting the best of the Clips. Rajon Rondo went for a 15-point, 12-assist double-double for the Lakers while Shai Gilgeous-Alexander posted 20 points, eight rebounds, and six assists for the Clippers. Anthony Davis’ time in New Orleans will end on Tuesday. But his career as Pelican ended in February when he requested to be traded. The Pelicans end this season Tuesday against the Golden State Warriors. Davis has been sitting out the final weeks of the season with “back spasms,” adding to the ugly ending of Davis and New Orleans. 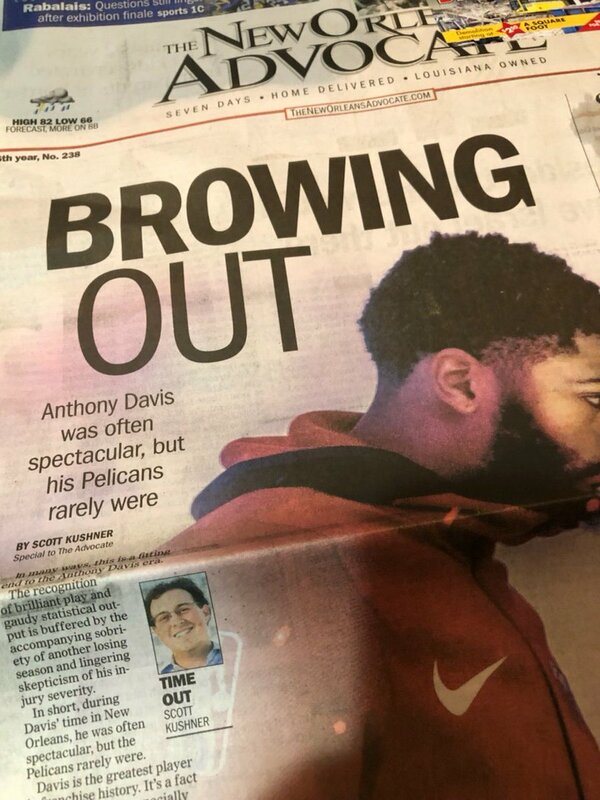 In many ways, this is a fitting end to the Anthony Davis era. The recognition of brilliant play and gaudy statistical output is offset by the accompanying sobriety of another losing season and lingering skepticism about his injuries’ severity. In short, during Davis’ time in New Orleans he was often spectacular, but the Pelicans rarely were. But he will never be truly beloved here. That kind of adoration is reserved for those who have carried their team to the championship heights or embraced the city despite the struggle to get there. Davis was excellent, but he did neither. So it’s fitting that his tenure in New Orleans, which at one time stimulated so much optimism, is ending with a whimper. In six seasons with the Pelicans, Davis 23.7 points, 10.5 rebounds, 2.4 blocks and 2.1 assists per game. In 466 games, he totaled 11059 points, 4,906 rebounds and 1121 blocks. Now we wait to see where Davis lands. 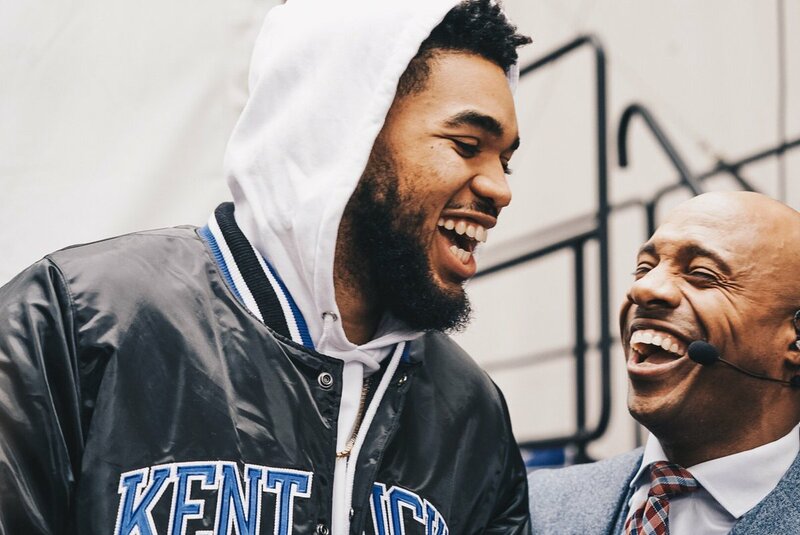 Does any former Wildcat rep Kentucky harder than Karl-Anthony Towns? I don’t think so. 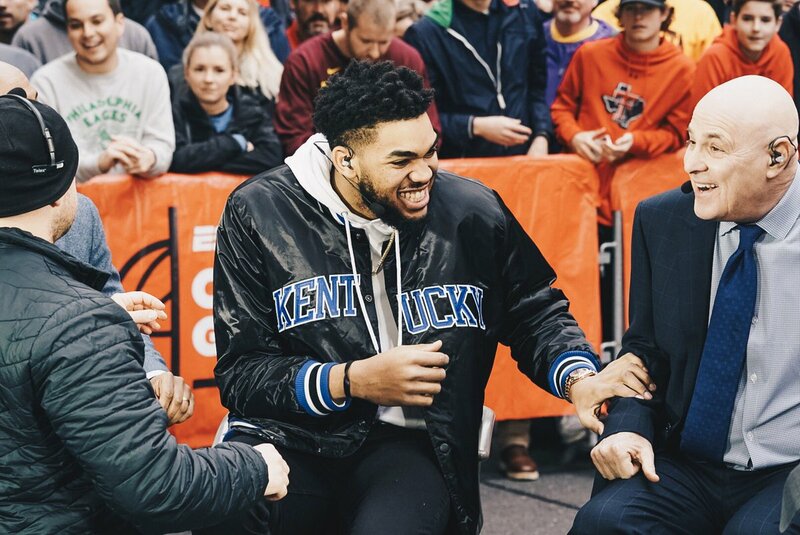 With the Final Four in his city, Towns stopped by ESPN’s College GameDay set to talk shop show the world his Kentucky swag. You see that recruits? When I grow up I want to be as cool as the Big KAT. Good morning, folks. Rajon Rondo is currently the Lakers best player, Anthony Davis was fined for flipping off a fan, and Eric Bledsoe was ejected two minutes into Thursday night’s game. Let’s talk NBA. Starting in Milwaukee, where the Bucks took down the Philadelphia 76ers 128-122 in a what was a thrilling battle between Giannis Antetokounmpo and Joel Embiid to the very end. Unfortunately, Eric Bledsoe didn’t make it to see said ending. In fact, he missed the last 46 minutes after he was tossed two minutes into the game. Bledsoe pushed Embiid after a made three-pointer by Antetokounmpo which led to Embiid tossing the ball at Bledsoe. The former Kentucky guard did not take kindly to the exchange and rifled the ball back at Embiid, leading to a scuffle and an early exit. In Sacramento, the Kings were able to hold off a pesky Cleveland Cavaliers squad by a score of 117-104. De’Aaron Fox posted 16 points, three rebounds, and 10 assists for his 15th double-double of the season. Willie Cauley-Stein added eight points and nine rebounds on a perfect 4-4 shooting. Brandon Knight shot 1-7 for the Cavs for five points, three boards, and three assists. And lastly, in Los Angeles, we had a blowout. The type of blowout where the game is decided in the first five minutes of action. The Warriors were up on the Lakers 39-12 after the first 12 minutes and ultimately won 108-90. Would you like to know who the Lakers were missing? Well, let’s list them all: LeBron James, Brandon Ingram, Lonzo Ball, Kyle Kuzma, Josh Hart, a sense of pride. And that’s how you get the final result where a 33-year old Rajon Rondo is the team’s best player. Rondo went for 12 points on 5-15 shooting and was a team-worst minus-32 in 29 minutes. DeMarcus Cousins registered 21 points and 10 rebounds for the Warriors – who were only missing Andre Iguodala – on 9-17 shooting from the field. In off the court news, Anthony Davis was fined $15,000 for giving a fan the bird after the Pelicans game on Wednesday night. Anthony Davis is leaving the New Orleans Pelicans this offseason with his middle fingers to the sky. This afternoon, the former Kentucky forward was fined $15,000 by the NBA for flipping off a fan following the Pelicans’ 115-109 loss to Charlotte last night. Pelicans‘ Anthony Davis has been fined $15,000 by NBA for showing middle finger to fan in New Orleans on Wednesday night. Davis, who has missed the last four games due to lower back spasms, was walking toward the Smoothie King Center exits when a fan yelled something his direction. In response, the 6-foot-11 big man tossed the bird right back with zero hesitation. Pelicans Wave, a fan Instagram account, got several responses back from Davis late last night about why he gave a fan the middle finger. Just three more games until New Orleans’ season is over and Davis can look forward to finding a new home. Good afternoon, folks. Can we please put a lifetime ban on injuries? Let’s talk NBA. Before we get into what happened to Devin Booker, let’s run through the recaps from a 12-game Wednesday night in the NBA. Starting with Kevin Knox, who dropped 21 points and four rebounds on 7-13 shooting as his New York Knicks fell to the playoff-hunting Orlando Magic, 100-114. In sad news, Isaiah Briscoe was waived by the Magic earlier on Thursday, preferring to sign Michael-Carter Williams for the remainder of the season. It’s a shame, honestly, considering Briscoe was playing the best basketball of his career before knee surgery cost him his season. But I would absolutely be shocked if Briscoe doesn’t find his way back onto an NBA roster next season, despite the injury concerns. He was a legitamite NBA role player in 39 games this season on a playoff team. Ban injuries (part 1). The Miami Heat fell to the Boston Celtics 112-102 in what would have been a massive boost in its playoff odds had they been able to win in South Beach. Bam Adebayo posted a 12-point, 12-rebound double-double in addition to four assists and two blocks in 26 minutes. In New Orleans, the Charlotte Hornets earned a must-win victory over the Pelicans, 115-109, despite Julius Randle going off for a BBNBA-high of 34 points in addition to his 11 rebounds and three assists. Anthony Davis (back) and Darius Miller (thigh) both sat out for the Pels. Michael Kidd-Gilchrist started only his second game of the season for the Hornets, posting five points and five rebounds in 20 minutes while Malik Monk added nine points and six rebounds in 17 minutes. Now, let’s take another look at where the Eastern Conference playoff standings currently sit at. Also, keep in mind that the Pistons (without Blake Griffin) lost to the Pacers 89-108 in Detroit. Let the race for mediocrity BEGIN! Winner gets the grand prize of being swept by the Bucks/Raptors/Sixers in round one. Moving along, Karl-Anthony Towns overcame a rough four-game stretch (where he averaged 19.3 points on under 35 percent shooting from the field) with a 28-point performance and a Timberwolves win over the Dallas Mavericks. Towns shot 12-15 from the field while pulling in 13 boards, dishing out three dimes, and blocking three shots. In Denver, the Nuggets dominated the San Antonio Spurs in a 28-point blowout after Spurs head coach Gregg Popovich was ejected 63 seconds into the game – the quickest ejection in NBA history. His postgame interruption of Nuggets head Mike Malone was “Classic Pop”. As for the Cats involved, Jamal Murray posted 14 points, six rebounds, and 11 assists in 30 minutes. With the victory in hand, Trey Lyles and Jarred Vanderbilt saw some court action, as well. Lyles got the most out of his five minutes, scoring seven points on 3-5 shooting to go along with two boards while Vando was scoreless in four minutes, contributing one rebound and one assist. In Phoenix, Devin Booker played only eight minutes before landing sideways on his ankle and simultaneously filling my tear ducts with a sad, watery substance. I won’t share the injury here, but Google it if you so choose. The good news is the X-rays came back negative, according to Shams Charania, and it looks to be just a sprained ankle. Phew. Ban injuries (part 2). The Trail Blazers made light work of the Memphis Grizzlies in Portland behind 21 points and 15 rebounds from Enes Kanter. The former Kentucky big has averaged 17.6 points and 11 rebounds per game in five starts since the injury to Jusuf Nurkic. He also posts a defensive rating of 96.2 in those games with an offensive rating of 116.5 for a net rating of plus-20.3, which is… insanely good….? The Blazers are 4-1 in those games, albeit four of those five games have come against non-playoff teams and the one loss was against the Pistons, so I remain skeptical that Kanter is really helping the Blazers this noticeably, especially on the defensive end. We’ll see what happens come playoff time when the opposing team hunts Kanter on mismatches every other trip down the court. And lastly, the Clippers were rung up by the Houston Rockets, 135-103, in L.A. Chris Paul even drilled a 60-foot jumper at the third-quarter buzzer just to rub in what was already decided. But Shai Gilgeous-Alexadner went out and did his thing, registering 20 points, four rebounds, four assists, and two steals on 8-16 shooting. Former Kentucky point guard Isaiah Briscoe will be looking for a new home next season. After playing 39 games with the Orlando Magic this season, the franchise decided to waive him this morning in order to make room for free agent guard Michael Carter-Williams. Briscoe, who signed with the Magic on July 6, 2018, averaged 3.5 points, 2.2 assists, and 1.9 rebounds in 14.3 minutes per game this season. Back in March, Briscoe underwent arthroscopic surgery to repair a small meniscus tear in his right knee. The Magic are currently listed as the eight-seed in the East with three games left in the season. With Briscoe unlikely to return in time for the first round of the playoffs starting on April 13, the team wanted to use his roster spot for another guard off the bench. Best of luck to Briscoe in his return from injury and finding the right fit for next season.